Introduction to the Theme: Has Christ Been Divided? “Has Christ Been Divided?” (cf. 1 Corinthians 1:13) is the theme for the Week of Prayer for Christian Unity (January 18-25). Begun in 1908, these days have been set aside each year so that Christians the world over may share the prayer of Jesus: “that all may be one... that the world may believe” (John 17:21). Note the dates and plan to participate in the following special observances. The annual Week of Prayer for Christian Unity begins this week, on Saturday, January 18, and continues through Saturday, January 25. The theme for 2014 is “Has Christ Been Divided?” (cf. 1 Corinthians 1:13) Use the Daily Scripture and Prayer Guide to join with Christians around the world praying “that all may be one... that the world may believe” (John 17:21). Plan to join with members of other Christian churches and communities in our area for the following special observances. The annual Week of Prayer for Christian Unity began Saturday and continues with (event) and concludes Saturday, January 25, with (event). 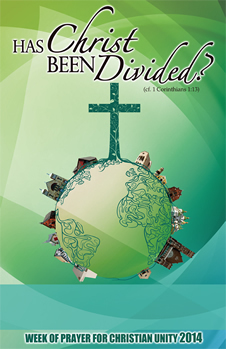 Let us join other Christian churches in our area as we remember the 2014 theme “Has Christ Been Divided?” (cf. 1 Corinthians 1:13) You are invited to participate in these and other ecumenical opportunities: (list planned events and activities). Today is Ecumenical Sunday when we celebrate what God is doing through the many ecumenical agencies—local, regional, national and international—that make up the modern ecumenical movement. As we continue our special prayers “that all may be one... that the world may believe” (John 17:21), we take time to familiarize ourselves with the work that (insert the name of one or more agencies) does to promote understanding and cooperation among Christians and others in our community. Although the annual Week of Prayer for Christian Unity has concluded, we continue to remember this year’s theme: “Has Christ Been Divided?” (cf. 1 Corinthians 1:13) and pray “that all may be one... that the world may believe” (John 17:21). In the coming weeks and months, we will be joining other Christian churches in our area in these and other ecumenical opportunities: (listed planned events and activities). Your active participation is encouraged.